If you've been following the blog long, you'll know that the boys love, LOVE the movie UP. It's our go to movie to watch in the car on long trips. 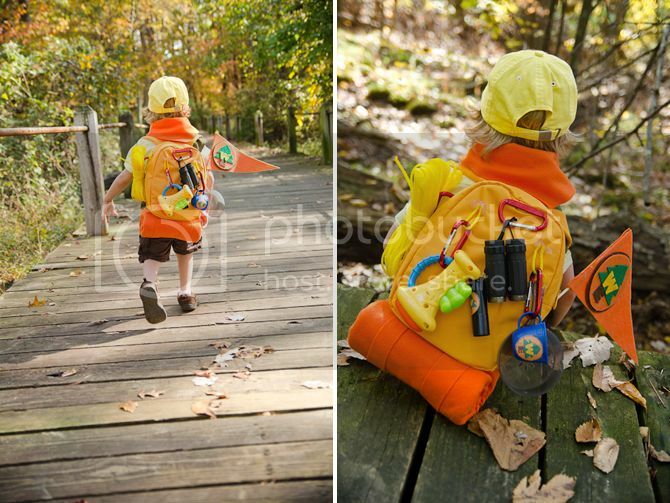 One of Braden's first tricks was to do the Wilderness Explorer call and cross his heart. 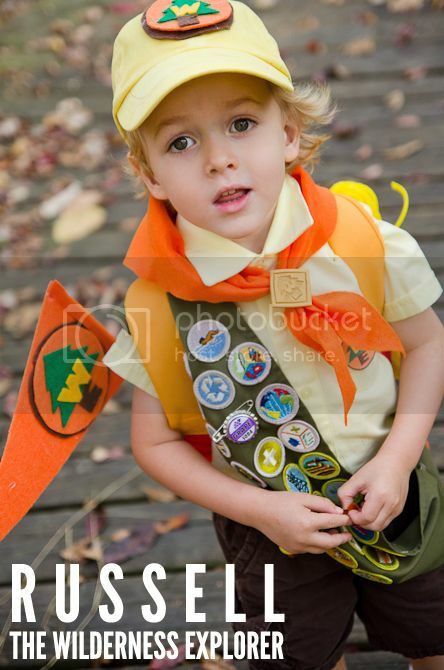 Finley has long insisted that we call him Russell and would make us act out scenes from UP, over and over. 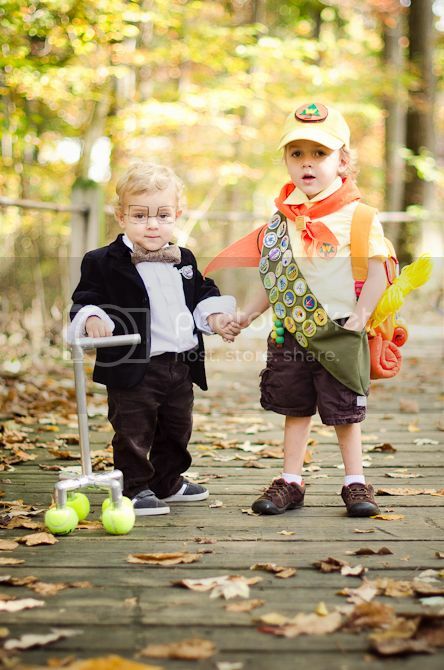 So obviously, I had to make the boys be Russell and Mr. Fredricksen for Halloween. I really didn't have a choice. 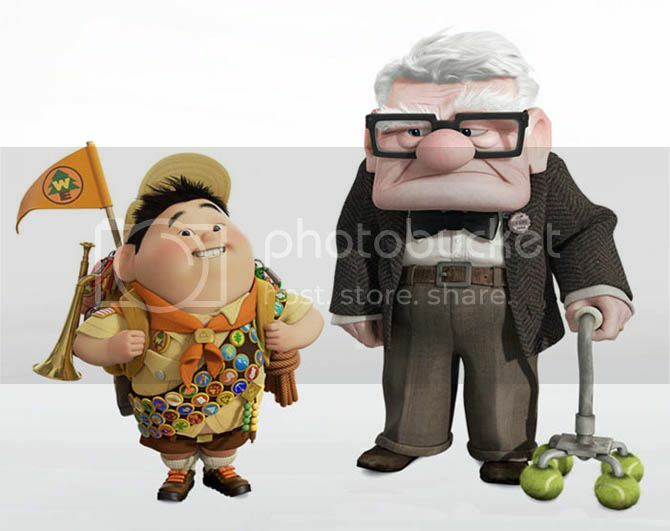 Even though the movie is three years old, I figured if people didn't know who the boys were they would still look like a boy scout and an old man (or as it turned out, Braden could also be mistaken for a hipster. Which is a hilarious baby costume, BTW.) This seemed like a much safer choice than their costumes last year, from a much more obscure (but equally charming) movie, Despicable Me. Next year I'll aim for making a more mainstream costume choice... so obviously the boys will be Walter White and Jesse Pinkman. Before I get to their costumes, I have to thank my dear friend Jenn, who immediately agreed to come photograph the boys when I called her in a panic because I had spent a million hours making these costumes and it was physically impossible for to get a decent picture of them while trying to corral them. If you need a photographer (or friend) in the DC area, Jenn is your girl. Except she's my girl, so you'll have to fight me for her. And now about their costumes. The base of the Russell costume was pretty simple. I found a yellow uniform shirt online (from French Toast) and used some brown shorts we already had around the house. Russell has brown boots with orange laces--and the pair I found at our local thrift store was pretty close! 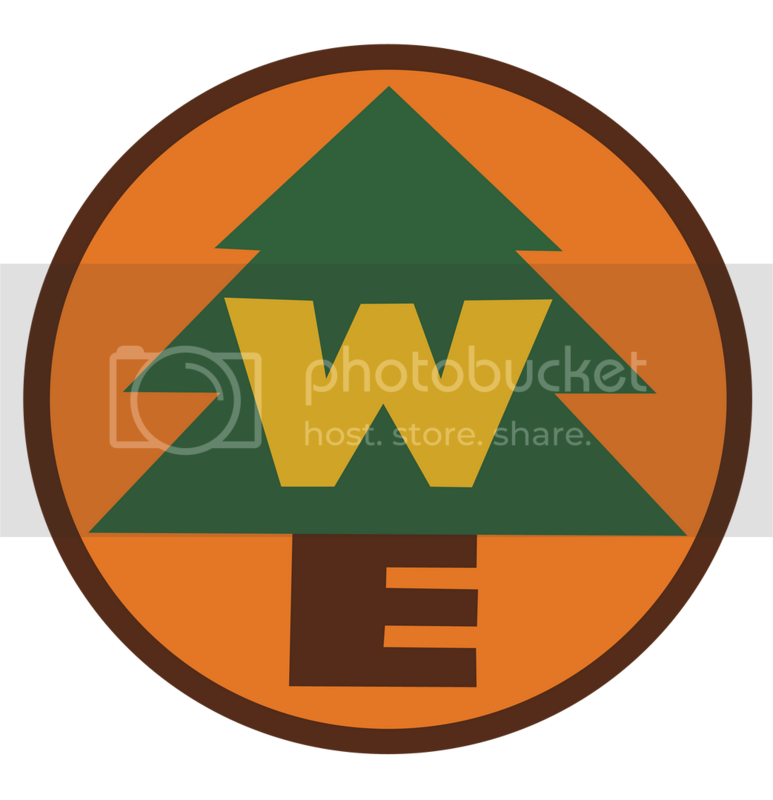 I found a white hat at the thrift store as well, so I dyed it yellow and made the Wilderness Explorer logo out of felt and hot glued it on. Just about the entire outfit is held together with hot glue. Finley's sash was a vintage boy scout sash I found on eBay that I fell in love with. There are lots of great examples online of people who made their own badges using Pixar's concept art for the badges and ironing them onto fabric... but I found that after I already spent too much on the vintage sash and couldn't bring myself to toss it aside, even if it meant making a more accurate one. I loved the vintage one--it's too perfect. I took off one badge so that I could pin on the Ellie badge (from Soda Pop Girls) that Mr. Fredricksen (SPOILER ALERT) pins on Russell at the end of the movie. 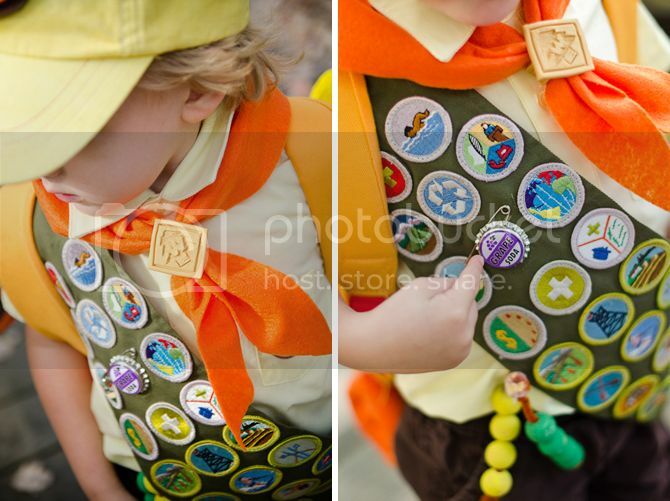 Braden was really interested in the badge and accidentally recreated the scene. Sweet boys. I painted some wooden beads yellow and green and put them on a brown pipe cleaner to make the little bead thing on Russell's shirt. I made the little gold diamond too, but it broke when I was trying to pin it on. Oh well. I initially made the bandana from plain orange fabric, but it was so light it didn't really sit well. I ended up using some orange felt, which was the perfect weight and texture. The little gold bandana medallion was made from Sculpey clay (available at Michaels). This was one of those things that I desperately needed Victoria to talk me out of... But it turned out so cute that I think it was worth it! Please don't ask for tips on how to make it, I'm sure I did it the worst way possible. And the pièce de résistance--the backpack. I miraculously found a little yellow backpack at our thrift store (which I've always complained about it being terrifying, but it does have a HUGE selection). Unfortunately, it had a huge jungle scene with an elephant on it--but the back was blank. So I took the straps off and sewed them to the other side. Problem solved. I made the flag from felt--the orange piece is the stiffened version, the other pieces (yellow, green, brown) are just regular Michaels felt. His bedroll on the bottom is just some orange felt I rolled up and hot glued (obviously) on the bottom of the backpack. I bought red carabiners and the yellow rope from Home Depot. All the other little doo-dads were pieces I found around the house. 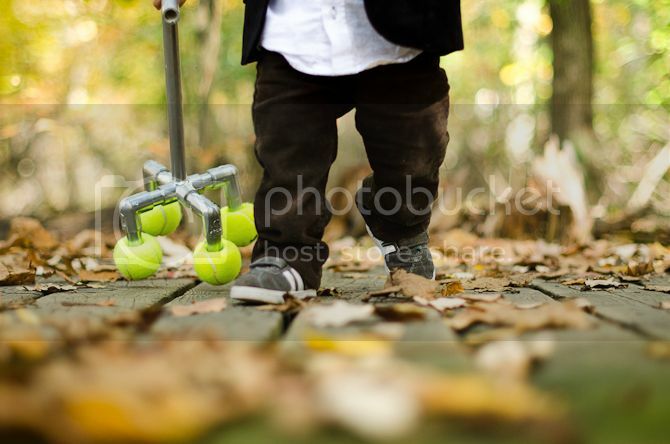 A pan and mug from our toy kitchen, a small pair of binoculars and flashlight, a toy trumpet... I was missing a red pocket knife, pot, water bottle, some lanyards and a pink bottle of lotion, but decided I did a good enough job. I couldn't believe Finley was willing to walk around in the backpack! It was getting heavy. I took the image below (click to make it huge and save to your computer) and printed a bunch of different sizes of it on sticker paper to use for various things. I realized last minute that Russell has the WE logo on his shirt, so I just slapped (gently) an extra sticker on Finley. I put the little logo on the blue mug and flashlight as well. You can also print it at a bigger size to use as a guide to make the felt logos on the flag and hat. Luckily it's a pretty easy shape to replicate. All in all, I'm obviously thrilled with how it came out. I did some complaining to Sol--the shade of the hat wasn't quite right, my rope and bedroll were the wrong color... but as he reminded me, I'm the ONLY person who knows what the costume was supposed to look like. No one else spends their free time googling images from UP. Just me. And now for Mr. Fredricksen! His costume was much much easier. White oxford shirt, brown corduroys and a cute black blazer. I couldn't find a tweed blazer, so I settled for making a tweed bowtie, much like the one from the mustache party. Um, adorable, right? He certainly has the stinkeye down. I couldn't resist buying another Ellie badge for him--it was too cute. I couldn't find baby glasses anywhere, and the chances of getting them to stay on Braden's face was zero--so I eyeliner-ed them on. He really didn't like them. I think that's why he's glaring at the camera. 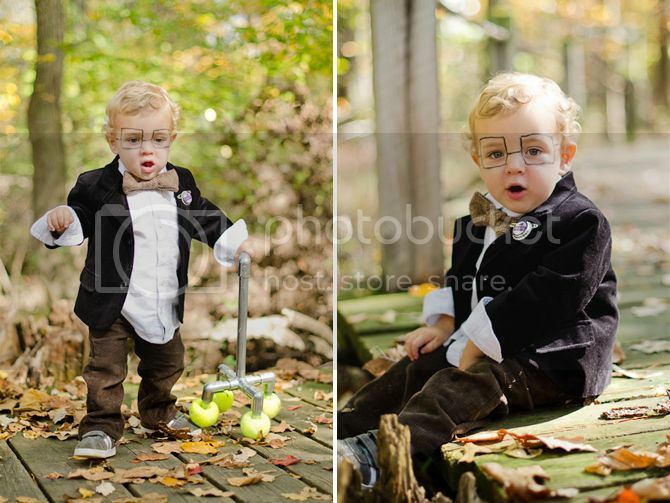 The cane was obviously the crowning achievement of his outfit. PVC pipe, spray painted silver. Tennis balls. Adorable. He really loved to carry the cane to the edge of the bridge we were on and throw it off. That's pretty much the only thing that made him happy. Stinker. Happy Halloween from these two sweet boys! I hope they have as many adventures as their fictional counterparts. 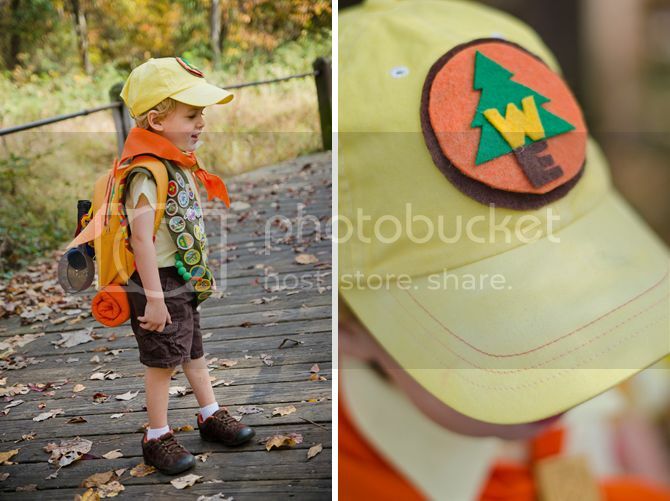 Thanks again to sweet Jenn for taking these pictures--I'm so happy to have them to look back on! And I hope this is helpful to anyone making UP costumes in the future--I scraped around to find pieces for a long time! The wilderness must be explored! CAW CAW ROAR! simply fantastic! awesome work Rachel. Obviously. Thanks a million for your help. I would have talked you out of many of these details. Good thing I don't live there because it's AWESOME. Seriously. I fell of the deep edge with this one. Why is no one paying me to do this??!? How creepy would it be if i PINNED that picture!? i cannot handle the "grouchy old man" picture. IMPRESSIVE! People pin ridiculous things all the time--so not creepy at all! I would have preferred a smiling boy, but the grouch was pretty priceless! You rock, plain and simple. This is so neat! I'm not a mama yet but I love when parents put the extra "oomph" into their kids costumes to make them special and unique. Adorable pics! 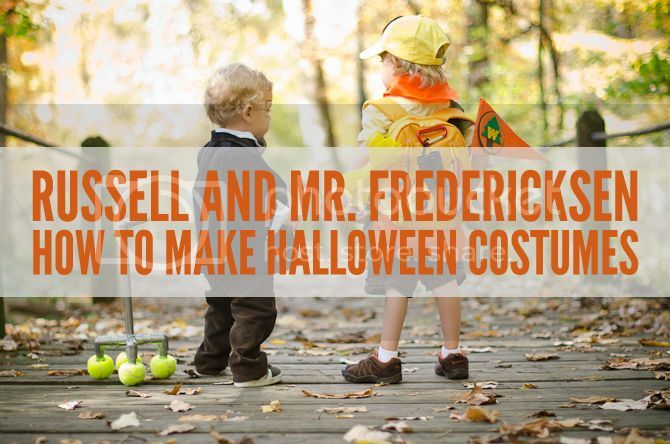 This Halloween will go down in the Pettit-Scott history of tales. I completely understand the obsessing over the details. It reminds me of the year that I dressed Summer as a Cabbage Patch Doll and HAD to make her a complete matching outfit and a wig from yarn and the shoes had to be exact, blah, blah, blah. 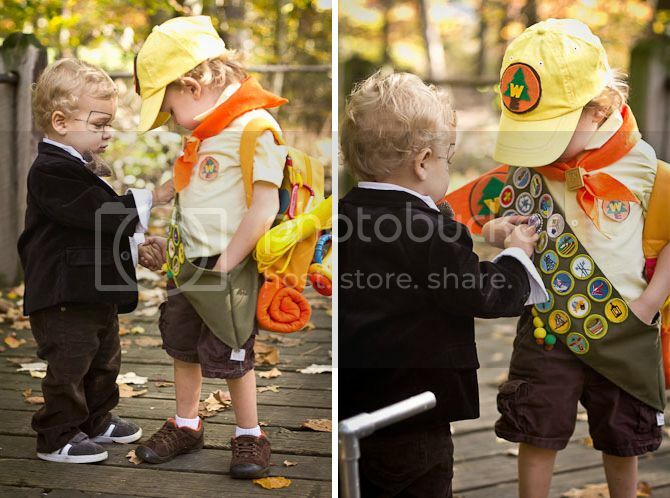 Anyways, these are two of the most adorable costumes that I have ever seen and Dave will be especially proud that Finley likes wearing authentic badges. (It's that Eagle Scout thing all over.) How fun for you to get your creative juices flowing! 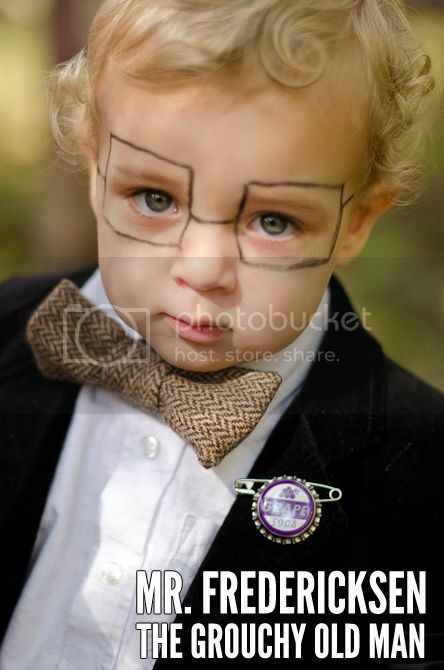 That Braden boy and his look makes me want to print Halloween cards of him and send them to all my friends. And I suppose I will have to introduce Finley as" Russell' from now on because who wouldn't want to BE Russell when you look that adorable. These are beyond adorable! I love the ways your boys are interacting too, looks like they are recreating the movie. I'm so impressed with all the little details, too! If I was the judge at a halloween costume competition I would give an award to Finley, Braden, and you for the best costumes ever!! I would like to request they wear these to Thanksgiving dinner. That is all. Crazy awesome! 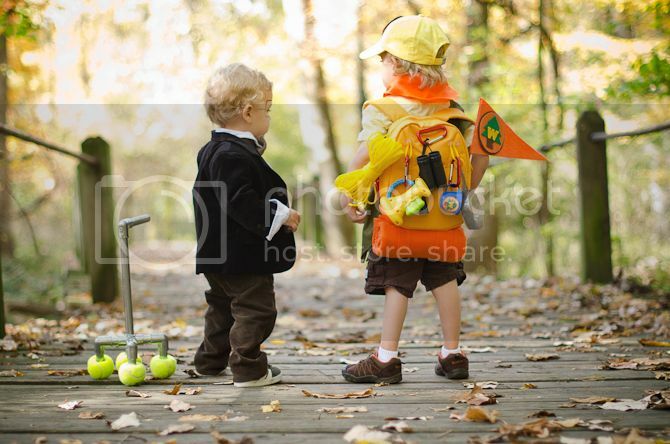 So glad to see another mom who thinks its wonderful her children dress as counterparts for Halloween. Ours have been Things 1 and 2, Jake and Izzy (from Jake and the Neverland Pirates) and this year Curious George and the Man with the Yellow Hat. LOVE the costumes, you did a great job! you're incredible! 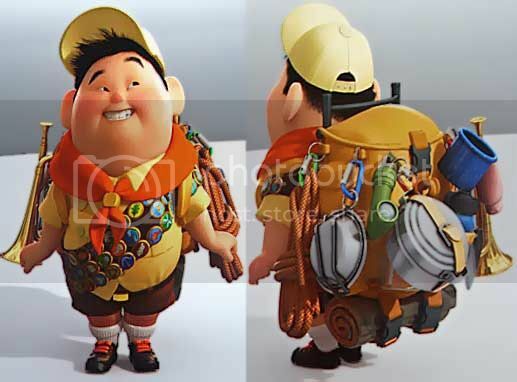 I'm going to give the Russell costume a shot for my little guy but I know it won't be half as good! how did you attach the pole to the bottom part of the cane? I bought all of the pieces and can't get it to stick.. tried two different super glues, hot glue, tried carving part away to create more surface area... please help!